In an effort to write the book and keep blogging, I decided to write/blog the last chapter, Chapter 2. I am doing this so I can receive feedback on this chapter as early as possible. Because this chapter, in my opinion, is probably the most critical of the book, it defines the context around ASP.NET MVC and how it differs from ASP.NET Web Forms, as well as giving a historical perspective of the MVC pattern. The Model-View-Controller architectural pattern has been around since 1978 and was first described by Trygve Reenskaug while working on a programming language called Smalltalk at Xerox PARC. The implementation was first described in his now famous paper on the subject, titled Applications Programming in Smalltalk-80: How to use Model-View-Controller, published on December 1979, and has been popping its head up in many different ways and forms since the original paper was published. Reenskaug maintains a page that explains MVC in his own words (http://heim.ifi.uio.no/~trygver/themes/mvc/mvc-index.html), and contains his publications on the subject; it is well worth the read and is only two pages long. Reenskaug explains on this site that "The essential purpose of MVC is to bridge the gap between the human user's mental model and the digital model that exists in the computer." As illustrated in Figure 2-1. He goes on to explain that "The ideal MVC solution supports the user illusion of seeing and manipulating the domain information directly. The structure is useful if the user needs to see the same model element simultaneously in different contexts and/or from different viewpoints." This is important because it puts the emphasis not on the application, but how the user perceives the data, the controller and view is only a means to the end of allowing the user to visualize the model in other words. 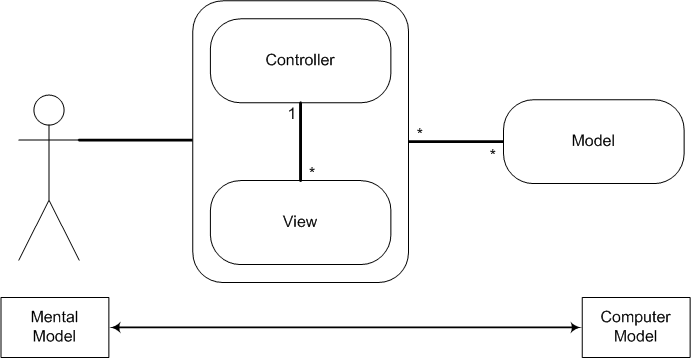 Reenskaug defines the Model-View-Controller in the following way. Model: Represents knowledge. A model can be in the simplest case a single object in your application, or in a complex case combination of objects. It should represent the world as seen by the developer for the application that is being developed, in other words your database or domain. View: Visual representation of the Model. It should highlight the certain aspects of the model while minimizing the others where possible. According to Reenskaug it should act as a presentation filter. What he describes as a presentation filter is the notation of a contract created between the Model and the View that will provide the parts of the model requested for the presentation by the View. Controller: A controller provides a link between the user and the system. It provides the user with actions that can be taken against the Model, which in other words creates a set of inputs that can be acted upon and represented to the user in one or more ways through a View. The concepts and ideas behind MVC were honestly a little abstract for me when I was first getting started, it took me a while to understand how the Model, View, and Controller where suppose to work together to create an application. Unfortunately at the time I didn't have a great example that clearly defined the lines between the different parts of the Model, View, and Controller, so I had to learn the hard way. Lucky for us Jeff Atwood, of codinghorror.com fame, provided an example that really struck a chord with me. Figure 2-2 is a visual representation of his example. This example almost perfectly represents MVC in a way that any web developer with only basic knowledge of HTML and CSS can understand. Model: The HTML is the "skeleton" or definition of the data to be displayed to the user. View: The CSS is the "skin" that gives the HTML a visual presentation. The CSS can be swapped out to view the original content in a different manor, without altering the underlying Model. They are relatively, but not completely, independent of each other. Controller: The browser is responsible for combining the CSS and HTML, into a final representation that is rendered out to the screen in the form of pixels. It gathers input from users, but it is restricted to the input defined by the HTML in the form of input, select, textarea, and button DOM objects. I find this to be an awesome acknowledgement to the success of the Model-View-Controller, because the browser is a natural interface for a computer user that wants to visualize the World Wide Web. It successfully maps the Mental Model, from Figure 2-1, that a designer envisioned as an interface for the user to the Computer Model, which a developer coded for use on the World Wide Web. So I hope this helped you visualize MVC in a way that helps you break out and understand the concepts behind the Model, View, and Controller. If you would like to read Jeff's full article it is available at http://www.codinghorror.com/blog/archives/001112.html. Model: The classes which are used to store and manipulate the state of the database, through our domain objects, combined with some business logic. Controller: The application layer that will accept the input and save that information to the database through our Model. It will also contain a small amount of business logic necessary for controlling and validating the inputs. The controller will also decide which view to render, the HTML, XML, or JSON depending on the form that was requested by the browser. The above definition of MVC for our application, The Beer House, is an almost exact representation of MVC as defined by the ASP.NET MVC team.